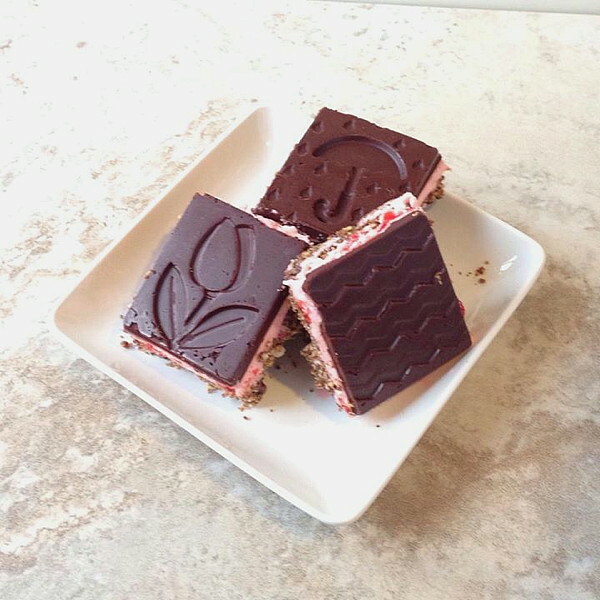 Cherry-almond Nanaimo Bars - Get the Good Stuff! Sept 2017: edited to reflect current company URL. No discount is available from GoodCook at this time, but if you like the spring-themed mold, it’s available from Amazon at the link shown below. This week, finally, it begins to seem like mild weather might arrive. Yes, here in Michigan we still have snow on the ground, but it’s melting, melting, and soon, I hope, it will be gone entirely. The calendar insists it is SPRING, and therefore bunny chocolates, egg hunts, and the like ought to be on my mind. I almost forgot about that! The folks at Good Cook reminded me. They sent an adorable silicone mold and spatula, and challenged me to Do Something Creative with them. What fun! Do look at the text below for the specifics on what they sent me, and how you, dear reader, can receive a 25% discount if you order from them. But let’s talk about the food. Nanaimo Bars are common in Canada, though little known in the US. They’re delicious three-layer bars that are even easier to make than brownies, and no less delightful. No one seems to know just who invented them. They’re named for a town – Nanaimo, BC – and even in that place, the origins of the bars seems to be clouded. At their simplest, the bars have a pressed-crumb bottom layer, a middle layer of custardy goodness, and a chocolate glaze on top. I’ll confess that to show off the pattern in the Good Cook mold, I built the bars pictured above upside down, in reverse order: chocolate first, then filling, then crumb layer – and it took some chilling and freezing steps to make it work – but I’ll give you the straightforward 8×8 pan version. Make bottom layer: heat 1/2 c butter, granulated sugar, and cocoa powder in a saucepan over medium heat. Cook and stir just until butter melts, about 2 minutes. Remove pan from the heat, and quickly stir in the beaten egg. Return the pan to low heat, cook and stir until the mixture thickens slightly, about 3 minutes. Remove saucepan from heat. Into the chocolate mixture, stir graham cracker crumbs, coconut, and almonds. Mix well, and then press this mixture firmly into an ungreased 8″ square pan. Make the middle layer: Using an electric mixer, beat 1/4 c butter, confectioners sugar, cherry juice, and almond extract in a medium bowl. Mix until smooth, then stir in the cherries. Drop this mixture by spoonfuls over the base layer, then spread it evenly. Let this mixture stand until firm, at least 10 minutes, then, using your hand, pat the cherry layer to smooth it. Make the top chocolate layer: melt 1 Tbsp butter in a small saucepan over low heat. Stir in the chocolate chips, and cook and stir until melted and smooth. Pour this mixture over the middle layer. Working quickly, smooth the chocolate glaze with the back of a spoon or an offset spatula. Chill at least an hour before cutting into bars. Good Cook discount for you! I promised to tell you about the discount, right? You might want to get one of these lovely molds for your own kitchen, or perhaps some of the other interesting cookware tools released this spring. 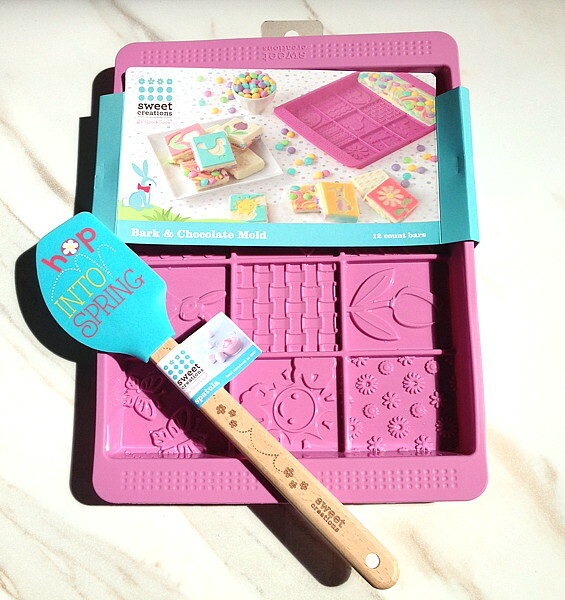 Do visit the Good Cook website to check out the Spring Bark Mold and the Sweet Creations spring cookware tools. If you use the code SpringFling you will receive a 25% discount. I found the silicone mold pan to be exceptionally easy to use, and as it is dishwasher safe, easy to clean as well. Remember that the mold is flexible, so you may want to place it on a flat pan to be able to move it when just filled. To unmold your confection, place a platter on top of the mold, turn the whole thing over, then peel the silicone away from your food. 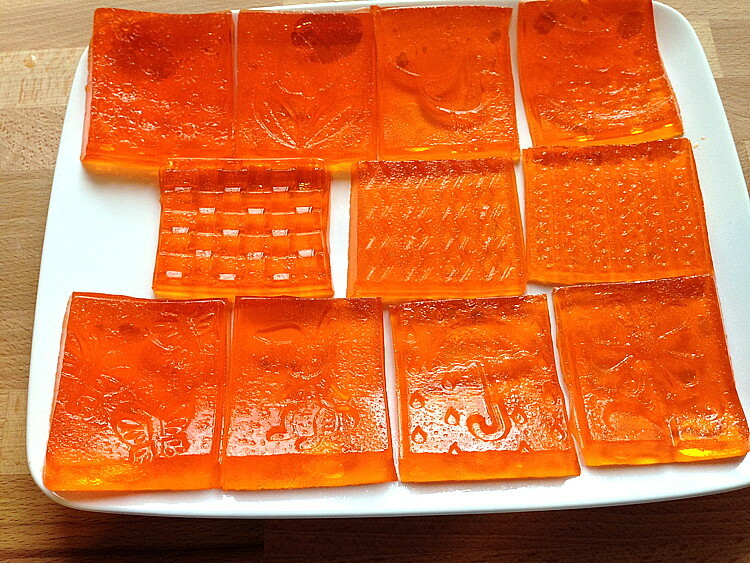 The pattern will be most obvious where the bottom layer is something capable of good definition: chocolate certainly works, but I tried making Jello blocks, and those did well also. The pattern of 12 squares makes portioning easy. The Good Cook company sent me their silicone mold and spatula to use, review, and keep. The recipe is my own, adapted from various sources. Opinions stated are entirely my own. Good Cook Kitchen Experts have been busy! Click here to see more Spring Fling recipes. I hope you’ll try them sometime – Nanaimo bars are terrifically easy, and the variations are endless. Original (vanilla filling), cherry, and mint are my personal favorites.